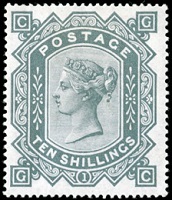 Surface printed British Stamps continued to evolve, during the period from 1873 to 1881. This period includes more design changes and additional denominations, and of course, multiple printings on papers with various types of watermarks. Beginning in 1873, the appearance of the check letter boxes changed. The new check letter boxes have a white background and colored check letters, instead of the colored check letter boxes and white check letters that had previously been used. Of course, these cosmetic changes to the printing plates would eventually require the re-issue of all the definitive British stamp denominations currently in use. The five stamps shown above, issued beginning in 1873, feature colored check letters on a white background. These were printed on paper with WMK 25 -- the Spray of Rose watermark. 3 P. (1873 - Plates 11-12, 14-20 - Scott #61) - Rose. 6 P. (1873 - Plates 13-17 - Scott #62) - Gray. 6 P. (1873 - Plate 13 - Scott #63) - Pale Buff. 1 S. (1873 - Plates 8-13 - Scott #64) - Pale Green, Deep Green. 1 S. (1880 - Plate 13 - Scott #48) - Salmon. The Scott Classic Specialized Catalog lists the 6 P. - Pale Buff denomination shown above as part of this set, It is only priced in used condition. The Stanley Gibbons catalog indicates that this stamp is an "abnormal" or "error". They indicate that these stamps, in the pale buff shade, were created at the same time the Plate 13 Imprimatur (PROOF) sheet was run off and that these were later perforated. Only a few perforated used examples of this stamp exist on watermarked Spray of Rose paper. The image above is of one of the imperforate examples from the Imprimatur (PROOF) sheet. It would be safe to say that the status of this particular stamp is questionable and that it is pretty much unobtainable. In 1875, a new 2 1/2 P. denomination British stamp was introduced. This stamp was printed on paper with WMK 28 -- the Small Anchor watermark. 2 1/2 P. (1875 - Plates 1-3 - Scott #66) - Claret on White Paper, Claret on Bluish Paper. From 1876, the 2 1/2 P. definitive stamps were printed on paper with WMK 29 -- the Orb watermark, and they were issued in two colors. 2 1/2 P. (1875 - Plates 4-17 - Scott #67) - Claret on White Paper, Claret on Bluish Paper. 2 1/2 P. (1880 - Plates 17-20 - Scott #68) - Ultramarine. Between 1876 and 1880, the 4 P. denomination was issued in new colors, and the 8 P. denominations were added. This group of stamps was printed on paper with WMK 23 -- the Large Garter watermark. 4 P. (1876 - Plates 15-16 - Scott #69) - Vermilion. 4 P. (1877 - Plates 15-17 - Scott #70) - Pale Olive Green. 4 P. (1880 - Plate 17 - Scott #71) - Gray Brown. 8 P. (1876 - Plate 1 - Scott #72) - Brown Lilac. 8 P. (1876 - Plate 1 - Scott #73) - Orange. The 8 P. denomination, printed in Brown Lilac, was never placed in use. In 1878, the two large-format, very-high-denomination definitive British stamps shown above were issued. They are exquisitely typographed and printed on white paper with WMK 26 -- the Maltese Cross watermark. 10 S. (1878 - Plate 1 - Scott #74) - Slate. 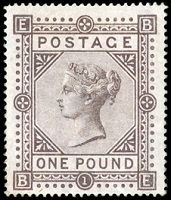 1 £ (1878 - Plate 1 - Scott #75) - Brown Lilac. As one could imagine, in mint condition, these British stamps are prohibitively expensive. Very attractive used condition examples may be acquired, for the dedicated collector not adverse to spending around $1,000 for a stamp! In 1880, Thomas De La Rue & Co. took over the contract for the printing of the letter-rate 1/2 P. through 2 P. postage stamps from Perkins, Bacon & Co. This required that new stamps be designed, prepared, and issued for the 1/2 P. through the 2 P. stamp denominations. Beginning in 1880, new, lower denomination stamps were added and some of the concurrent higher denomination stamps were re-issued. This new group of definitive postage stamps were printed on paper with WMK 30 -- the Imperial Crown watermark. 1/2 P. (1880 - Scott #78) - Deep Green. 1 P. (1880 - Scott #79) - Red Brown. 1 1/2 P. (1880 - Scott #80) - Red Brown. 2 P. (1880 - Scott #81) - Lilac Rose. 2 1/2 P. (1881 - Plates 21-23 - Scott #82) - Ultramarine. 3 P. (1881 - Plates 20-21 - Scott #83) - Rose. 4 P. (1880 - Plates 17-18 - Scott #84) - Gray Brown. 5 P. (1881 - Scott #85) - Deep Indigo. 6 P. (1880 - Plates 17-18 - Scott #86) - Gray. 1 S. (1881 - Plates 13-14 - Scott #87) - Salmon. In 1881, two new 1 P. stamps were issued. This simplified design was printed in two types. These new stamps were also printed on paper with WMK 30 -- the Imperial Crown watermark. Type I - 14 dots in each angle. Type II - 16 dots in each angle. 1 P. (1881 - Type I - Scott #88) - Lilac. 1 P. (1881 - Type II - Scott #89) - Lilac, Lilac on Bluish Paper. For the specialist, there are a multitude of collectible varieties of most of the British stamps described on this page, including essays, die proofs, plate proofs, color trials, plate markings, plate numbers, control numbers, shade varieties, etc. For details, please refer to the Stanley Gibbons Specialised Catalogue - Volume I - Queen Victoria.